This is the Middle Bronze Age in West Asia, about 2100 BC to 1700 BC. It corresponds roughly to the First Intermediate Period in Egypt, and just as in Egypt this was a time when West Asia was broken up into a lot of little kingdoms instead of being one big empire. In Greece, this is the time when the Indo-European invaders arrived and destroyed Lerna. Other Indo-Europeans, going south instead of west, reached West Asia around the same time as they reached Greece, about 2000 BC. 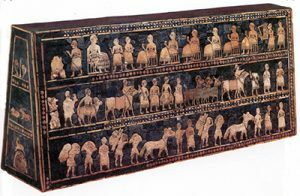 They settled in Turkey with their horses, where they were known as the Hurrians and the Hittites. In West Asia, it was a time of conflict between the settled people in the cities of Ur and Uruk and Mari, and the wandering nomads, the Amorites, to their east and west. The nomads sometimes traded with the city people, and sometimes attacked them, and sometimes the city people attacked the nomads and tried to make them pay taxes. Gradually the Amorites became more settled, though they also conquered some of the cities, including Babylon. Eventually the Amorites made themselves the rulers of most of the land between the Persian Gulf and southern Turkey (where they got into fights with the Hittites and Hurrians), and all down the Mediterranean coast through Lebanon, Syria, Jordan and Israel. Their descendants formed the Babylonian Empire. At the end of this period, around 1700 BC, the Amorites may have even invaded Egypt, where they were called the Hyksos, or foreigners. For Ur and the cities of the valley between the Tigris and the Euphrates (Mesopotamia, the land between the rivers), this was a good time. They had their independence back for a while, though many cities fell under Amorite rule. Mesopotamians built more great ziggurats, in particular at Ur. It was around this time, according to the Bible, that another Semitic nomadic group, the Jews, who had been living around Ur, left and wandered west toward the Mediterranean coast. But probably the Jews really started out in the Levant, along the coast. There may be some truth to the Bible story, but nobody knows what that might be. Cite this page: Carr, K.E. Third Dynasty of Ur – Mesopotamia – West Asian history. Quatr.us Study Guides, September 14, 2017. Web. April 18, 2019.